This is more of a favourite at home than cooked pasta. The joy is that it’s fresh and vegetable based without gluten. If you don’t have a spiraliser, thickly grate your vegetables for the same wonderful result. airtight container. Do not add sauce or salt for storing. Put all the sauce ingredients into a blender and blend until the mixture is of a thick consistency. 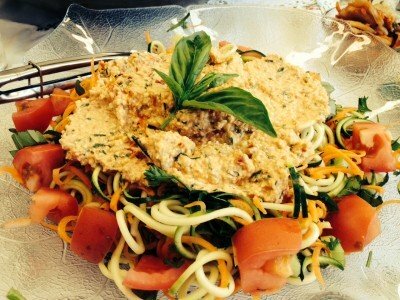 Spoon over the top of the spiralised or grated raw vegetable pasta. Top with some sliced spring onion, a diced tomato, and a few of your own herbs such as oregano and basil to the top to make it look pretty. Buy your spiraliser online from Jill at Our Kitchen Roars They are many, many times cheaper than the equivalent I found in a kitchen shop recently for $156. How ridiculous!